ered as a brief and useful measure for assessing alexithymia. lity to distinguish between emotions and bodily sensations. 1970; Taylor, Ryan, & Bagby, 1985). by disordered affect regulation (Taylor, Bagby, & Parker, 1997). connected from their own subjective emotional functioning. of alexithymia (Taylor et al., 2000). has been recently criticized for having various shortcomings. component (Vorst & Bermond, 2001; Bermond et al., 2007). orders and a part of the non clinical group. ploying the smallest number of items as possible. TAS-20 (Bressi et al., 1996). BVAQ (Bermond et al., 2007; Ricci Bitti & Codispoti, 2002). used the Italian version of the EDI-3 (Giannini et al., 2008). individual and group administration procedures were used. tive of assessing the validity of the hypothesized construct. using SPSS software v. 18 and AMOS v. 6.0.
one-factor structure with 71.1% of the total variance explained. variables and the scale’s factor (see Table 1). = .04; see Figure 1). tionnaire (BVAQ) showed good values (see Table 3). < .01); Maturity Fears (MF) (r < .25, p < .05). higher values of Alexithymia scores than the non-clinical group. All these differences are statistically significant (see Table 4). 20 several measures have been developed, including the BVAQ. mia consisting of five items. 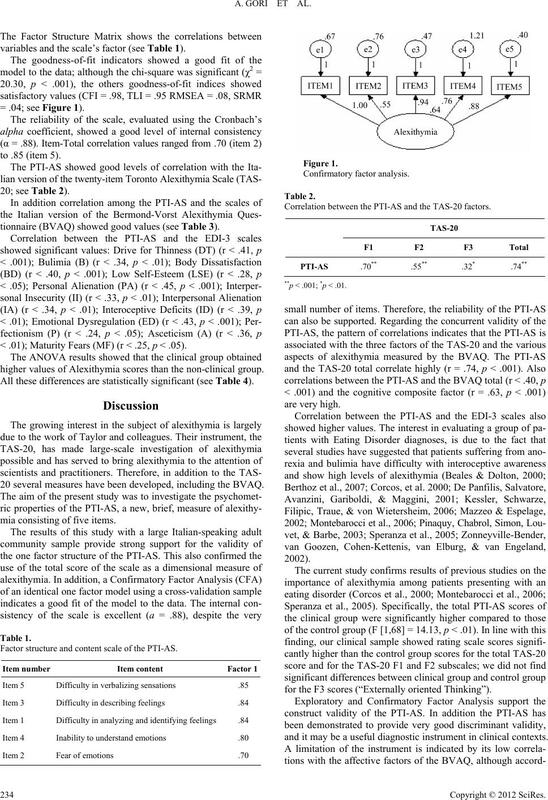 Factor structure and content scale of the PTI-AS. Correlation between the PTI-AS and the TAS-20 factors. **p < .001; *p < .01.
for the F3 scores (“Externally oriented Thinking”). and it may be a useful diagnostic instrument in clinical contexts. Correlation between the PTI-AS and the BVAQ factors. ANOVA between the two groups. tion of possible cause-effect relationships. urement. Psychotherapy and Psychosomatics, 32, 180-190.
factor structure. 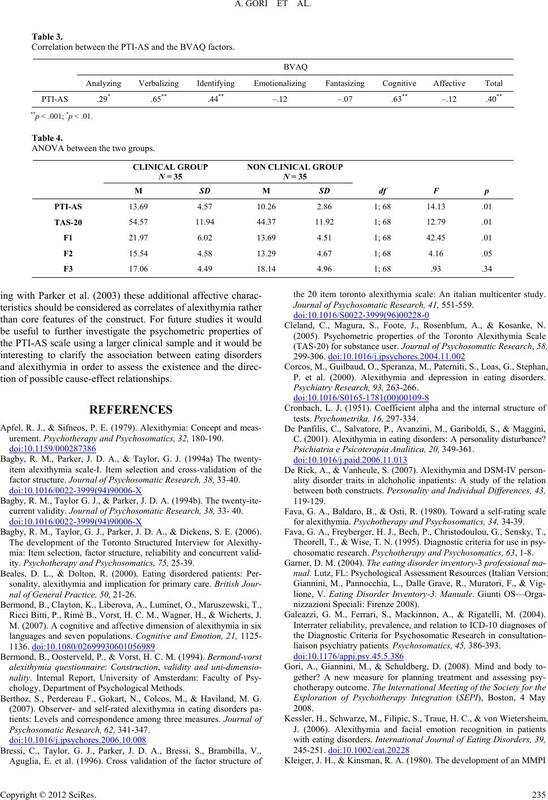 Journal of Psychosomat i c Research, 38, 33-40.
current validity. Journal of Psychosomatic Research, 38, 33- 40. Bagby, R. M., Taylor, G. J., Parker, J. D. A., & Dickens, S. E. (2006). ity. Psychotherapy and Psychosomatics, 75, 25-39.
nal of General Practice, 50, 21-26. Ricci Bitti, P., Rimé B., Vorst, H. C. M., Wagner, H., & Wicherts, J.
chology, Department of Psychological Methods. Berthoz, S., Perdereau F., Gokart, N., Colcos, M., & Haviland, M. G.
the 20 item toronto alexithymia scale: An italian multicenter study. Journal of Psychosomatic Re sea rch , 41, 551-559. Cleland, C., Magura, S., Foote, J., Rosenblum, A., & Kosanke, N.
P. et al. (2000). Alexithymia and depression in eating disorders. C. (2001). 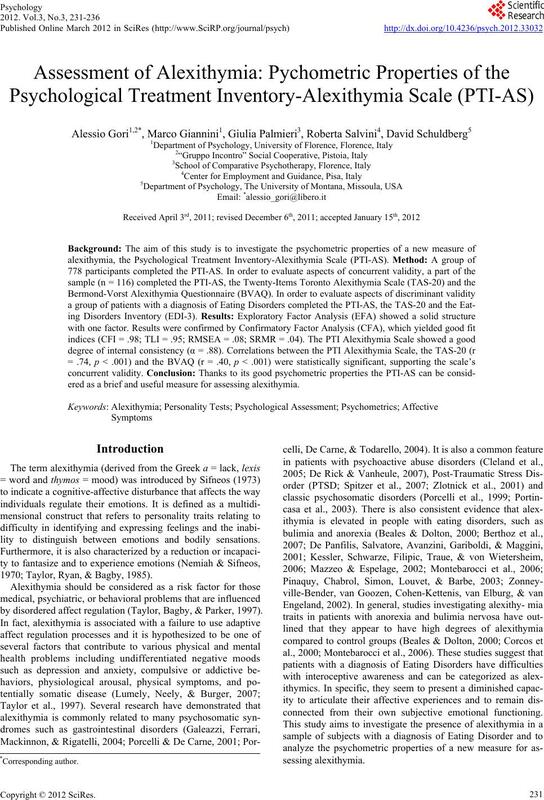 Alexithymia in eating disorders: A personality disturbance? Psichiatria e Psicoterapia Analitica, 20, 349-361.
for alexithymia. Psychotherapy and Psychosomatics, 34, 34-39.
chosomatic research. Psychotherapy and Psychosom at ics, 63, 1-8. Galeazzi, G. M., Ferrari, S., Mackinnon, A., & Rigatelli, M. (2004). liaison psychiatry patients. Psychosomatics, 45, 386-393. Alexithymia Scale. Psychotherapy and Psychosomatics, 34, 17-24.
logical studies. 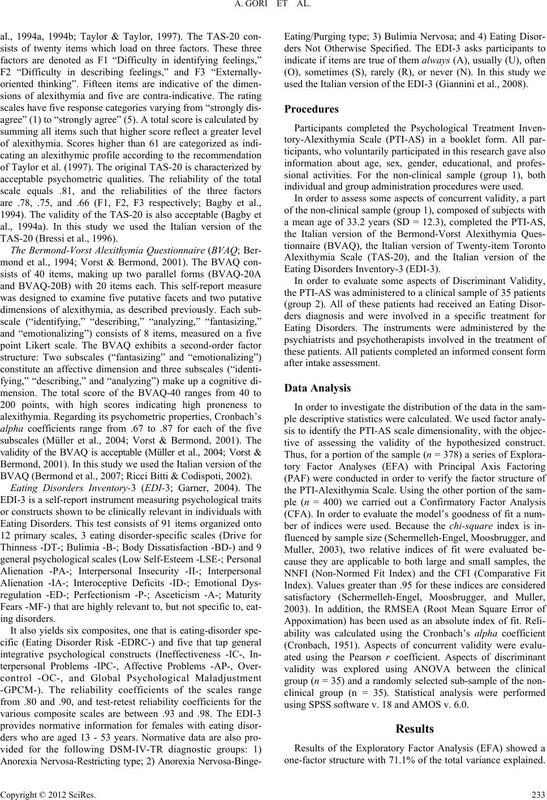 Journal of Psychosomatic Resea r ch , 54, 533-541.
disorders. Eating and Weight Disorders, 11, 14-21. Pinaquy, S., Chabrol, H., Simon, C., Louvet, J. P., & Barbe, P. (2003). Porcelli, P., Taylor, G. J., Bagby, R. M., & De Carne, M. (1999). ity and dysphoria. The (non) expression of emotion. In: A. J. J. M.
Vigerhoets, & J. J. van Bussel (Eds.) Health and disease (pp. 32-34). Sifneos, P. E. (1986). The schalling-sifneos personality scale-revised. 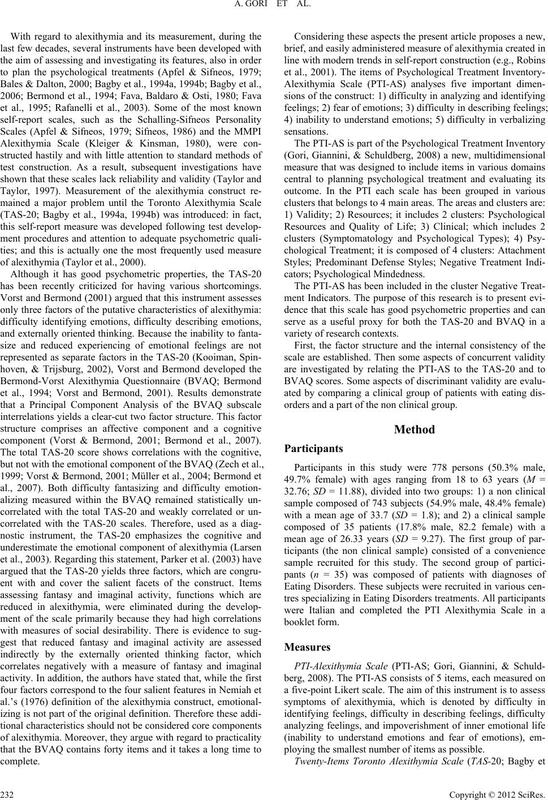 Psychotherapy and Psychosomatics, 45, 161-165.
thymia in eating disorders. 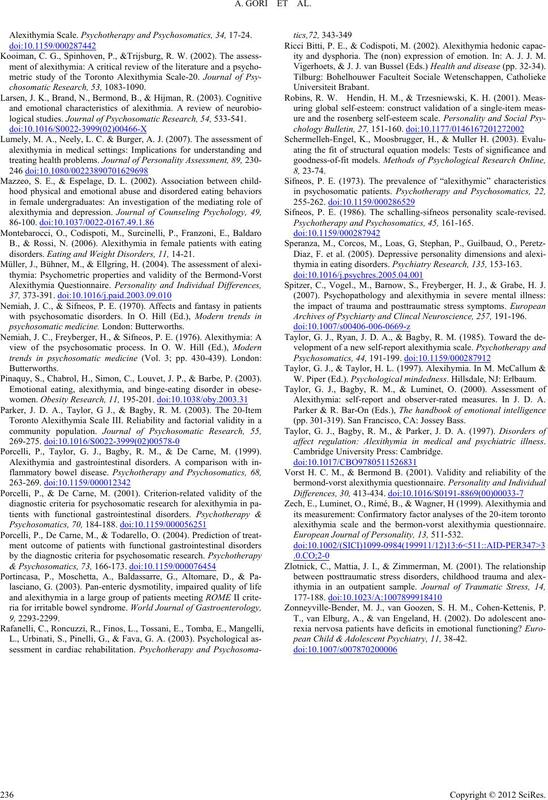 Psychiatry Research, 135, 153-163. Spitzer, C., Vogel., M., Barnow, S., Freyberger, H. J., & Grabe, H. J.
Archives of Psychiarty and Cli n c al Neuroscience, 257, 191-196. W. Piper (Ed.). Psychological mindedness. Hillsdale, NJ: Erlbaum. Alexithymia: self-report and observer-rated measures. In J. D. A. (pp. 301-319). San Francisco, CA: Jossey Bass. affect regulation: Alexithymia in medical and psychiatric illness. alexithymia scale and the bermon-vorst alexithymia questionnaire. European Journal of P e rs o na l i ty , 13 , 511-532. Zonneyville-Bender, M. J., van Goozen, S. H. M., Cohen-Kettenis, P.
pean Child & Adolescent Psychiatry, 11, 38-42.